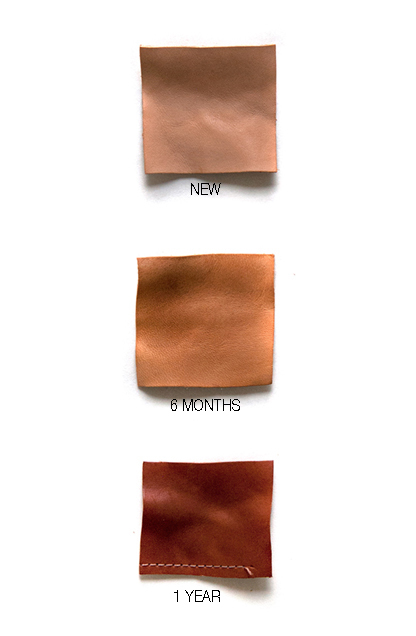 We love working with vegetable tan leather due to it's unique aging process. The more it is used, the quicker it will show it's patina. We leave the leather untreated so that it ages with your use. Extra virgin olive oil may be used to speed up the patina or to recondition the leather. Lightly massage the leather in a circular motion with a lightly oiled cotton pad. Let it soak in for at least 4 hours. Do not worry about streaking as the oil will penetrate and continue to weather evenly. Note: You DO NOT need to apply olive oil for the leather to transform. It will do this naturally over a longer period of time. If you have cleaning questions or concerns, please contact a profesional leather cleaner to ensure proper care. Never submerge leather in water. Our canvas is water repellent, but not water proof. Spot clean with water and mild soap or contact your dry cleaner. Waxed canvas is water repellent/resistant. You should not wash it or submerge it in water. Think of it as leather and let it age on it's own. Naturally stain resistant, hair-on leather is very low matinance. If needed, wipe down with a dry or lightly dampend cloth. Never submerge leather in water.